We tried Hatch chiles for the first time last week. These New Mexican chiles have a short season and are not available at every store in Seattle. Last week I picked some up at one of my favorite supermarkets to give them a try. I used the broiler to “roast” them until they were charred. Then I put them in a sealed Ziploc bag to let them cool off. After they were cool, the skin slipped right off. I slit them lengthwise and scraped the seeds out. The Hatch chiles were ready to go. We first tried them sautéed with some red pepper and onion as a side dish with grilled skirt steak. They are quite good, although I wouldn’t call them amazing. I suspect that they are probably better if you buy them fresh from the fields in Hatch, New Mexico. They may lose some of their punch on the journey to Seattle. Apparently, they can range from mild to medium-hot. Overall, our batch was mild, but every once in a while we had a bite that was noticeably hotter. So after that dinner, I had 4 large chiles left. I searched eatyourbooks.com and found that I had an interesting recipe in One Big Table by Molly O’Neill. Mika Garnett’s Southwest Chicken and Green Chile Stew proved to be a great use for the chiles. The introduction says that she uses a 4-ounce can of chopped green chiles when she doesn’t have time to roast and peel her own. I just substituted my Hatch chiles. The recipe is very easy and we really enjoyed it, but it did take a bit longer to make than I thought it would. The thing that took the most time was prepping all of the vegetables, including cutting fresh corn kernels from the cobs. But the result was well worth it. 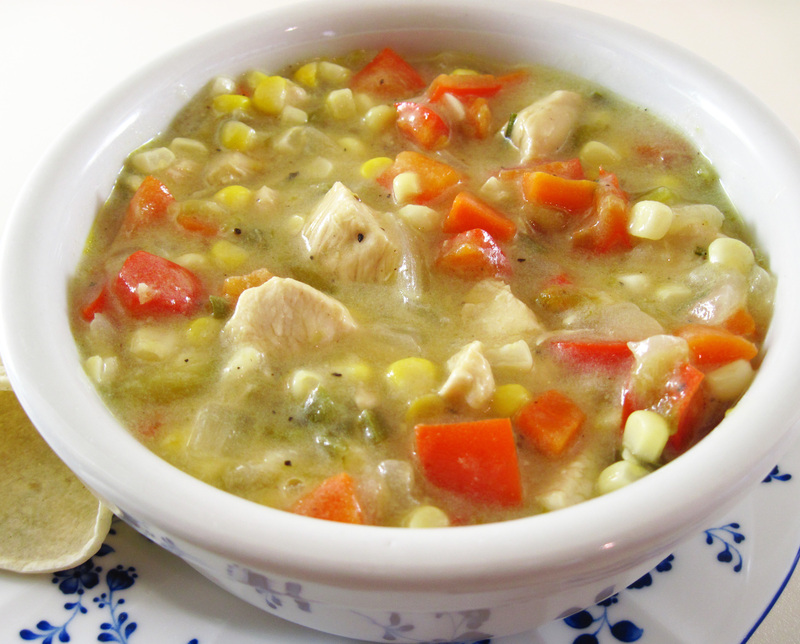 With all of the fresh vegetables, Mika Garnett’s Southwest Chicken and Green Chile Stew is a perfect late summer meal! Update 8/22/2016: Important warning about hatch chile peppers! This is a really great recipe, so I made it again yesterday with 4 hatch chile peppers that I had bought at Thriftway. They had two side-by-side boxes of hatch chile peppers that looked identical. One was labeled “Hot” and the other “Mild”. I chose the mild. When I researched hatch chiles before making this 3 years ago, I found this information someplace: “Apparently, they can range from mild to medium-hot.” Wrong! I now know they can range from mild to insanely hot! Thinking I had identical peppers to the ones I had used before, I just added them to the chile. Just before serving I used a spoon to taste the broth for seasoning. I’m talking about 1/2 teaspoon of broth with NO visible signs of pepper pieces in it. WHOA! I don’t think I’ve ever eaten anything so hot before. I thought the top of my head was going to blow off. Now, I’ll admit I am a bit of a sissy when it comes to hot stuff. I order 2* at Thai restaurants and it’s plenty hot for me. I knew there was no way I could eat this stew tonight. I quickly popped an emergency freezer meal into the microwave for my dinner. Bob, Mr. 5*-Thai-food-guy who usually asks for extra hot sauce to add, said he’d eat the stew. Well, he did finish his bowl, but I have never seen him sweat so much when he eats hot stuff! After he was finished, he admitted that it was even too hot for him! I’m passing on the lesson I learned from all of this. Never assume your chile peppers are mild or medium. Taste a bite before adding them to your recipe. Had I done that, I would have used 1/2 – 1 of these crazy-hot chiles and it probably would have been fantastic. Lesson learned! I used potato starch flour to make the recipe gluten free and it worked great, but you can use all-purpose flour as Mika does. 1. Heat the oil in a large pot over medium heat. Add the onion, red pepper, carrot, and jalapeno and cook, stirring occasionally, for about 5 minutes. 1b. (Update) If using fresh Hatch chiles, taste a bit to determine how hot they are and then decide how many to add in step #2. 2. Add the green chiles, garlic, cumin, and salt and pepper. Stir and cook for about 1 minute. 3. Stir the potato starch flour (or all-purpose flour) into the pot until it is well blended. 4. Add the chicken broth and the chicken. Bring to a simmer and cook for 5 minutes. 5. Add the corn and cook for about 5 more minutes, or until the chicken is done. 6. Stir in the lime juice and the cilantro. Serve with optional garnishes if desired. 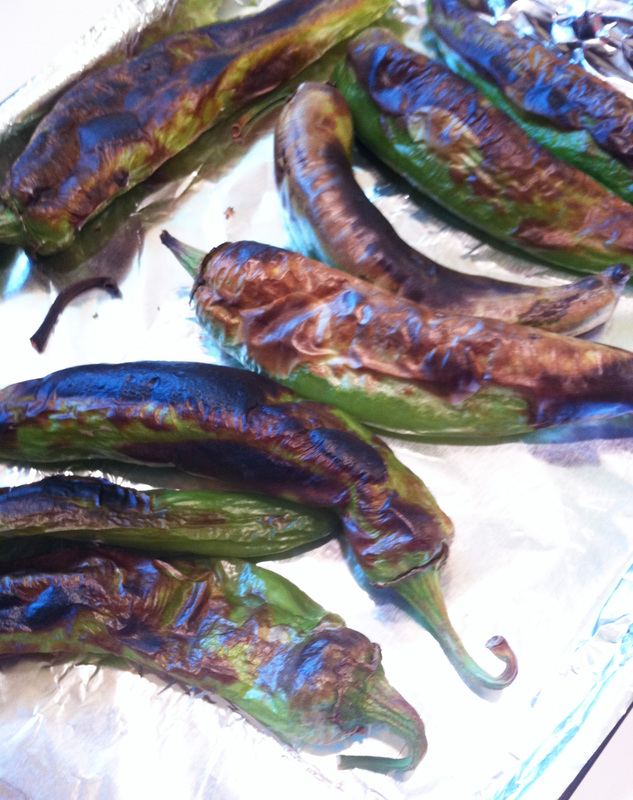 Hatch chiles that I broiled on a foil-lined baking sheet. I’ve wanted to try those chilies for so long. My friend in Arizona always talks about them. I think if we got them here, they might suffer a little too. But I’m sure they would still be good. I’ll let you know if I find some and can make some stew. They were still great even if shipped from New Mexico to Seattle! Do you not love them? This is our favorite time of year! So many great peppers this time of year, right? We bought some great poblano chiles at a local farmers’ market. There were SO many different varieties of peppers all over the market. I may have to search out some more hatch chiles.